KMCMUN’17 is a first of its kind avenue for students to come together and engage with each other on topics that concern the global community, being part of any o the 4 committees. The Round Table is an independent organization of Kirori Mal College, which has always been associated with igniting young minds and empowering students to speak up and think extra-ordinarily. 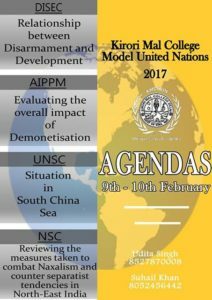 Through KMCMUN’17, the main aim is to provide a platform to enhance critical thinking and knowledge of the operations to form deep intellectual bonds, all towards the end goal of self development. Executive Board details: Click here. Contact: Facebook page is here.